Has anybody, in their entire life, travelled an astronomical unit? 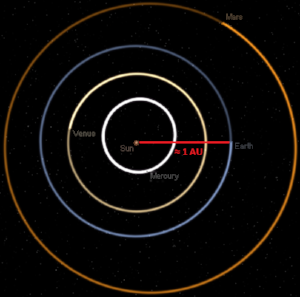 Just how far is an astronomical unit (AU)? Such an enormous distance is not easy to comprehend. I could say, well, it’s the average distance from the Earth to the Sun. But nobody can actually travel from the Earth to the Sun to get a feel for that distance (and even a future space explorer would never travel it in a straight line). But maybe we can put this distance in terms of human experiences by asking: has anybody travelled an AU in their lifetime? To clarify, when I ask if anyone has travelled an AU, I mean in the reference frame of the Earth. We all technically travel over 6 AU every year just by orbiting the Sun. But we don’t perceive that movement. Just like we don’t perceive the movement of our solar system orbiting around the centre of the Milky Way. A driving survey performed by AAA revealed that the average American drives 17,000 km annually. This means, the average American drives (or is driven) approximately 1.2 million km in their lifetime. That’s still only 0.008 AU. What about planes? Average yearly flight times vary considerable from person to person, so let’s switch viewpoints to those who spend their lives in the sky. Commercial airline pilots are allowed to fly up to 1000 hours per year. Considering that a Boeing 747 has a cruising speed of 920 km/hr, a very ambitious pilot may fly 35 million km in their life. Now that’s 0.23 AU. We’re getting closer. What about astronauts? Many of them have travelled around the Earth at 29,000 km/hr on the International Space Station (ISS), sometimes for months at a time—or nearly a year in the case of Scott Kelly and Mikhail Kornienko. Surely these astronauts have travelled an AU already. In fact, they've travelled even further. In the 340 days spent aboard the ISS, Scott Kelly and Mikhail Kornienko travelled about 1.55 AU. The current record holder for farthest distance travelled in a lifetime is certainly cosmonaut Gennady Padalka who spent 878 days in space. He travelled a grand total of 4 AU in his lifetime. In fact, more than 50 astronauts have travelled over 1 AU aboard the ISS, Mir, and Salyut 7 space stations. So although the average person may not be able to comprehend the colossality of the AU, these 56 elite astronauts can imagine 215 of the days they spent in space; whipping around the planet as if they were riding a cosmic merry-go-round.